Join our movement to fight against racism and discrimination around the world! 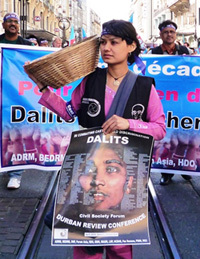 By connecting discriminated groups and advancing the international human rights mechanisms, IMADR devotes itself to eliminate racial discrimination. Empower discriminated groups to make their voices heard for their rights. Promote solidarity among discriminated groups to make changes in national, regional and international levels. Advocate for the implementation of the International Convention on the Elimination of All Forms of Racial Discrimination (ICERD) and other instruments and strengthening institutions.